Barely a day goes by just now without a UKIP candidate in some part of the country exposing themselves as a raging bigot with a poor grasp of social media privacy settings. 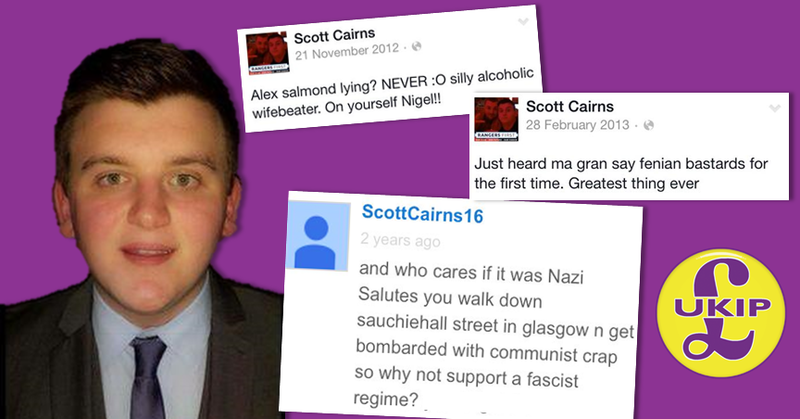 Tonight it was the turn of prospective Coatbridge, Chryston and Bellshill MP Scott Cairns, whose social media outpourings were spotted by freelance journalist Aidan Kerr, with a number of screenshots posted to Twitter in which Cairns boasts of his support for “a fascist regime”, calls Alex Salmond a “silly alcoholic wifebeater”, and accuses “looney lefties” of persecuting him. Within minutes, Cairns had disabled both his Facebook and Twitter accounts, but not before denying that his Facebook ever belonged to him. Despite it containing thousands of postings and photographs, he said it was a “fake account”, although conveniently it was then deactivated within a matter of minutes. If someone really has been running a fake Facebook account purporting to be Cairns for the past four years, full of inane posts about drinking with his pals and Rangers FC, then hats off to them for their commitment, although it seems unlikely. 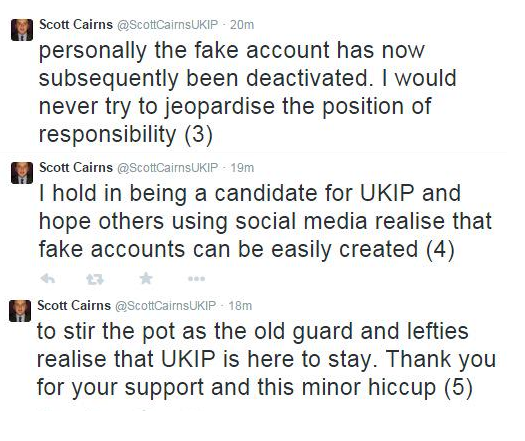 Cairns describes the “fake posts” as a “minor hiccup”, although demands are likely to now grow for UKIP to take action against him. The fact that Cairns immediately blocked those posing questions to him and suddenly deactivated his social media accounts certainly suggests he might actually view it as more more than a “minor hiccup”. This is far from the first time that an election candidate has provoked major embarrassment for UKIP, who are still trying to convince the country that they’re respectable, mainstream and definitely not racist. In reality, Cairns posts expose the reality of anti-immigration bigotry in Scotland, which has always been grounded in British nationalism and loyalism. With one eye on the chance that he might actually want to reactivate his Facebook account at some stage in the future, Cairns adds, “I might however in the future create a facebook account as sometimes the pros outweigh the cons in terms of winning support for the campaign”. We’d recommend it – it’s a great way of keeping in touch with friends and family and sharing funny jokes about politics! Maybe keep a closer eye on the privacy settings next time though, Scott. Voters in Coatbridge, Chryston and Bellshill, and across the UK, will go to the polls on May 7th. Scott Cairns is unlikely to be an MP any time soon. I’ts rather strange how he managed to deactivate the account if it wasn’t his own. Guess he’s just not ministerial quality. Is the 16 in his Youtube username his age? And seeing from how he looks like a kid, this is all making sense now. Another day, another Kipper revealed as a Nazi. In this case it’s prospective UKIP candidate for Coatbridge, Chryston and Bellshill in Scotland. He was caught posting bigoted, sectarian and pro-Fascist comments on his Facebook page. He has also followed the standard Kipper response of claiming that they were put up there by others, though as the article says, anyone who did so must have been especially dedicated to fake a blog going back four years. Rather more controversially, the article suggests that racism in Scotland is linked to unionism and loyalism. I’d hope that wasn’t the case, but the comments from Arthur Misty Thackeray, the Kipperfuehrer for Scotland, who also made racist, Islamophobic and sectarian comments, suggests it is. 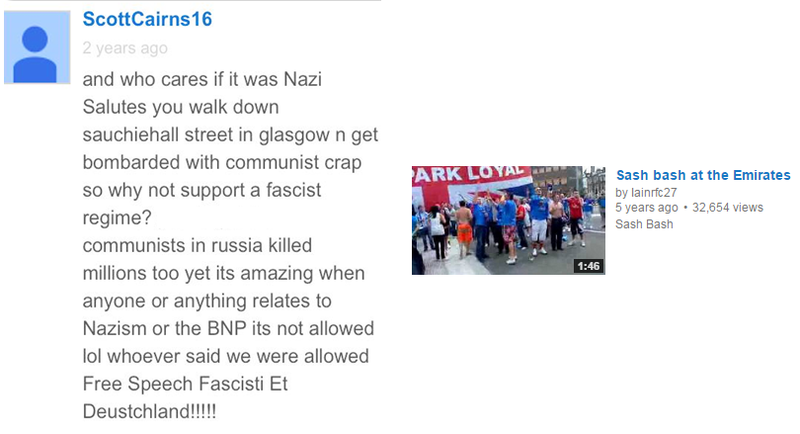 What is it with these sevcoians and nazi saultes how can they commerate our fallen on Poppy Day in one hand while with the other do a racist sign which our grand dads fought its bizzare to say the least ,racist scum like this have no place in Scotland the quicker we get Indy and they move to Wales the better there granddads will be turning in there graves they really are sad sick scum ! I have never seen a more disgusting blog than yours while acting all high and mighty about the Poppy and Grandads cause I guarantee that yours did not fight under a British flag. I also bet you take the Queens pound in your pocket so if you are so anti british as is the source of this rubbish then why oh why do you stay here and hate what keeps you nice and comfy behind a keyboard? Be a real man join the Army and see life outside! He’s a bigoted,fascist idiot who when exposed cut and ran like a coward. Given the vile language he said he heard from his grandmother,it’s reasonable to speculate he learnt his hatred and putrid views from his equally vile family…but you defend away. hi gaming first and foremost were a Surrey based blog lol yes bow to you Southern Celtic master you sevcoian southern arselicker lol my grandad was a war invalid wheelchair bound a love England but hate britishness its so last century and a myth a waring cult and a elitist con as for joining the army am in the army the Jesus army lol my grandad paid a hevey price fighting fascists thats why untill my last breath a fight it all the way hail hail mind the gap oh and 1 last thing a bet your grandad hidden in the ship yards like all the other pretend loyal west coast orange men enjoy the play offs because a know the rest of the footballing world will laughing at you oh and another thing the keyboard is mighter than the sword ! You’d think a far-righter in Scotland would trying NOT to split the unionist vote. Wonder if the Daily Record will run with this one. Not only an immature fanny, bigot, and stupid looking, imo,but is has he not committed a criminal act. Where are our boys in blue?.